After reading many Amish novels by Beth Wiseman, I was anticipating the release of this book. It did not disappoint! From the moment I read the prologue , I was sucked into the plot. This novel caused supper to be late, kept the light on into the night, and made me want to just set life aside until I had finished it. It was a roller coaster ride! As Mallory travels to Pakistan and meets Abdul, her future husband, her life slowly begins to change as she learns the truth of his life and his plot. My heart sank as I read the changes that came to her life as a result of her choices. 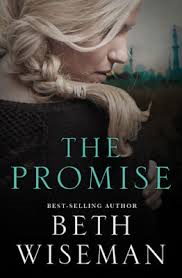 The Promise is not only a gripping story, but also poses many thought provoking questions? Is the God of Muslims the God of Christians? When parents and friends discourage us from a decision, how closely should we heed their advice? How much prayer should precede our decisions? How far would you go to fulfill a life goal? for love? I highly recommend this riveting book. You can purchase it here. Thank you to Beth Wiseman, Lit Fuse, and Thomas Nelson for providing this book in exchange for my honest review.